Since our founding in 1891, academic excellence, a distinguished faculty, and a heritage of preparing our cadets to become tomorrow’s leaders have been the centerpiece of New Mexico Military Institute. NMMI offers a unique learning experience built upon a curriculum that is mission directed, a comprehensive approach integrating education, training, and experience, and a totally integrated high school and college learning environment. Academics at NMMI is founded upon teaching the fundamentals in English, Math, Science, language and communication, but enhanced by the knowledge and abilities required of leaders of the millennium generation. Our approach combines a traditional learning focused methodology with the most current state of the art and appropriate educational technologies. The cornerstone of learning at NMMI is a close all-encompassing faculty cadet relationship enabled by morning, afternoon, and evening one on one and group tutoring opportunities. Among America’s learning institutions, NMMI is unique because it integrates a four-year college preparatory high school curriculum with that of a two-year university parallel junior college. For this reason we do not think of NMMI as a collated high school and junior college but as a six year seamless learning experience in which cadets progress as fast and as far as their capability, potential, and vision permits. Academic resources and individually tailored programs provide a learning flexibility not common elsewhere providing the opportunity for exceptional cadets to achieve a high school diploma and an Associate Degree nearly concurrently. At NMMI we seek and welcome a spectrum of cadets from across the nation and the world, who while differing in abilities, have in common a potential and passion to learn. Our cadets and faculty engage one another as they examine new ideas and challenge old ones. We view education as a shared responsibility among our faculty, cadets and parents. Clearly defined learning outcomes are continually assessed through a rigorous process, based upon understanding, confirming, and improving our curriculum. We invite and welcome you to be a part of our learning experience and to graduate prepared to lead your generation. Academic offerings are grouped into five divisions each headed by an Associate Dean who exercise close supervision over course content and instructional procedures. The divisions are Humanities (including art, English, foreign languages, communications, philosophy, and music); Natural Sciences and Mathematics (including biology, chemistry, geology, physics, and mathematics); Social Sciences, Business Administration, and Criminal Justice (including criminal justice, business, political science, history, sociology, psychology and computer concepts and ROTC programs); Health, Physical Education and Physical Performance; and Library and Cadet Academic Services. Junior and Senior ROTC - senior (college) ROTC programs are operated by active duty officers and non-commissioned officers of the Department of the Army while Junior ROTC offers leadership courses for the high school taught by retired officers/non-commissioned officers. Courses are offered leading to the high school diploma, Associate in Science and the Associate in Arts degrees. Pre-professional curricula at the college level addresses concentration areas and specializations. The Institute’s college programs are accredited by the Higher Learning Commission of the North Central Association. The high school academic program is identified by AdvancEd as “College Preparatory.” The Institute does not offer vocational-technical programs. NMMI is proud to have been accepted as a member of the North Central Association Academy for Assessment of Student Learning (Assessment Academy). The Board of Regents have final authority in all academic matters pertaining to high school and college cadets. The Dean is primarily responsible for addressing academic procedural matters. The New Mexico Military Institute Board of Regents’ reserves the right to change or withdraw, without notice, courses, curricula, policies, tuition, fees, or any other matter contained in this catalog. Such changes are recorded in the Registrar’s Office. An entering college cadet falls under the requirements stated in the catalog at the time of admission or the catalog in effect at the time of return. A college cadet may elect to change to the current catalog upon written request. New Mexico Military Institute is first and foremost a strong academic institution. The policies in the academic area are designed to underscore this fact to maintain the strong reputation of the degrees and diplomas held by NMMI graduates. Failure to meet minimum academic standards can lead to suspension. Attendance at all scheduled classes is mandatory and considered essential to the discipline and education of each cadet. Cadets may freely add or drop classes through the first two weeks of a semester. Cadets who wish to drop a course must initiate the drop with the academic advisor. High school cadet drops are then routed through course instructor to the Associate Dean, the Principal and the Registrar. The last day for cadets to drop a class with a (W) is the Friday of the 10th week of classes. Drops after this date are graded WP or WF. WF grades will affect the cadet’s GPA. Drops are accepted through the end of day on the last day of academic classes prior to the start of academic retreat for final exams. Drops are not approved after final exams begin. NMMI’s grading system is a 4.0 system with no extra credit given for honors or college courses. Grades with a “T” or “D” prefix are special grades for either transfer work (TA, TB, etc.) or deportment (DA, DB, DC, etc.). Transfer grades will show on transcripts, but, deportment grades will only show on progress reports/report cards. “TR” grade is a special college transfer grade which awards earned credit toward graduation, but does not directly affect the GPA. However, a “TR” grade replacing an “F” or “D” grade earned at NMMI will raise the cumulative GPA by replacing the lower grade in the cumulative GPA. Cadets may retake a course in an attempt to raise a grade. If a higher grade is made the second time the course is taken, the lower grade is removed from the overall GPA but remains on the transcript. Credit hours will not be awarded twice for the same course. If taken outside of NMMI, a “TR” grade will not affect GPA (cumulative) unless the first grade is “F” or “D” because of the repeat policy. College credit is allowed for successfully completing the various AP tests. AP credit may be transferred to the Institute to meet graduation requirements, although the Institute does not use CLEP scores in computing a cadet’s grade point average. Current credit policies can be accessed on the College Board website. College credit is allowed for successfully completing the ACTFL proficiency tests. Credit may be granted towards graduation upon receipt of official scores on the ACTFL Oral Proficiency Test (OPI), although the Institute does not use these scores in computing a cadet’s grade point average. Up to 12 hours of language credit may be granted based on the ACE recommended guidelines. With the Academic Dean’s approval, a cadet may challenge a course offered at NMMI. If successfully challenged, usually by passing a test prepared by the academic department concerned, credit for the course will be shown on the transcript. Challenge actions are initiated by the cadet with the approval of the head of the appropriate academic department. A fee for the challenge examination will be required in accordance with current Board of Regents’ policies. Challenge examination results are reported on a “Credit” basis on the transcript. Challenge credits do not affect grade point averages. Neither challenge nor CLEP credits satisfy minimum load requirements to maintain cadet status (must be full-time status). A challenge exam may not be attempted if the cadet has already received a grade (to include audit, W, WF, I, P, AU or WP) for the attempted course, nor during the last three weeks of academic classes without special permission, however, under certain circumstances a cadet may retake the challenge exam. Sixth Class (high school freshman). Approximately 65-140 high school freshmen are admitted to New Mexico Military Institute each year. Fifth Class (high school sophomore). A cadet must have completed five-and-one-half academic units that apply toward the high school diploma. English I must be one of the units submitted. Fourth Class (high school junior). A cadet must have completed eleven academic units to include English I and II that apply toward the high school diploma. Third Class (high school senior). A cadet must have completed seventeen academic units to include English I, II, and III that apply toward the high school diploma and have completed all but one unit in each of the core curriculum sequences. Second Class (college freshman). A cadet must have a high school diploma or an equivalent from an accredited high school or a GED, and meet other minimum admissions requirements. First Class (college sophomore). A cadet must have completed 30 academic units that apply toward the associate degree. All NMMI high school courses are numbered from 001 to 099, e.g. ENG 011, ENG 012, MTH 021 etc. All NMMI junior college courses are numbered from 100 to 2999 and are “lower level” college courses designed to meet basic college educational requirements. The semester prior to graduation, after scheduling starts for their final semester a cadet must apply for graduation. Those planning to graduate must complete the application for graduation at that time. All graduates are expected to participate in the graduation exercise unless specifically excused by the Academic Dean. At the last formal grading period prior to graduation, the Registrar assesses all graduating cadets to place the top cadets (at this grading period) in Highest Honors, High Honors and Honors. The Registrar then publishes this listing for staff, faculty and cadets. Faculty must ensure that all grades are in on graduates before graduation. When all grades are in, the Valedictorian and Salutatorian are determined based on final grades. The actual award is not posted to the transcript until all grades are final, official, and grading is closed. Midyear graduates have their own formal ceremony in December and will not participate in the May ceremony. Opened in 1985, this modern facility combines the traditional architecture of the campus with modern functions, aesthetics, and technology. As a focal point of the Institute’s academic life, the Learning Center is the home of Paul Horgan Library, Toles Learning Resources Center, Writing Center, College and Career Center, and Mabee Lecture Hall. The library offers cadets opportunities for intellectual growth and discipline within a very comfortable and user-friendly environment. An educated person must locate, interpret, and apply information on many subjects in a variety of presentation formats. To be prepared for the next level of education, cadets must analyze, evaluate, and synthesize information from varied sources. In so doing, students will acquire knowledge and skills which will contribute to a life of learning with a global perspective. Organized using the Dewey Decimal System, the collection contains over 200,000 items in physical, digital, and audio-visual formats. Our web page connects cadets to our online library catalog, and access to databases consisting of thousands of electronic resources, which are available 24/7 from any internet-connected device. Our subscription to World Catalog allows us to borrow resources from other libraries across the United States. In keeping with its charter, the Toles Learning Resource Center (TLRC) offers programs, activities and strategies to support and enable cadets to experience academic success, maximize learning potential, produce high quality work, succeed in a multi-cultural world, and be prepared for a full range of options and opportunities. Cadets can get help with time management, reading and writing enhancement, math strategies, general study skills, and ACT/SAT preparation as well as seek information on how best to prepare for furthering their education. Formal courses and individualized help are offered to assist cadets to reach academic and life goals. The College and Career Center, a part of the TLRC has an extensive collection of resources on careers, colleges, universities and professional school catalogs, personal finances, financial aid, and college life. Cadet may seek career counseling, skills assessments, interest inventories, and information on academic competitions, awards, and prizes. The Writing Center provides support to every cadet who needs assistance with his/her writing. Staff guide students through the writing process - from brainstorming ideas to polishing a final draft. The Center’s goal is to assist students as they develop their writing and editing skills during their transformation to talented, competent writers. In addition to being open during night study hall, the Writing Center hosts a webpage with additional information and links to help cadets improve their writing. The College and Career Center houses an extensive collection of college information from both domestic and international schools, testing information, test preparation programs and applications. Through Internet connections, cadets may research information on colleges and universities and complete on-line applications. The Career Information System (CIS) is a college and career research tool available to all cadets. In addition to researching colleges and careers, cadets can complete assessments to help them determine what occupations may be a good fit for them as well as complete scholarship searches. CIS also has a resume building tool as well as information about applying for and interviewing for jobs. Cadets can access CIS through their MyNMMI portal, using their cadet number (with zeroes) as their username and 2013Nmmi as their password. Cadets needing assistance with CIS should stop by Toles for assistance. Our trained college advisors support students’ career planning processes as well as guide them through their transitions to college life. Advisors work with students to develop a course of study which not only meets their academic study goals at NMMI but also assists in a smooth transfer to a four-year college or university. College athletes work with our athlete academic advisor to ensure they take a program of courses that helps them graduate on time, maintain NJCAA eligibility and qualify for transfer to their next institution. Cadets who have not declared a concentration are assigned to an advisor within the Toles Learning Resource Center. Cadets who are planning on applying to a US Service Academy will be assigned to the Academy Prep Director for advising, unless they declare a concentration. The Early Warning System is used to identify at-risk students so appropriate interventions can be utilized. These interventions range from dorm room visits during Night Study Hall for the purpose of encouraging students and offering suggestions for improvement to assignment in special programs such as Guided Night Study Hall and Mandatory Night Study Hall, which help students develop effective study habits and gives them an opportunity to study in a closely monitored venue. Academic Assistance is a class which provides high school cadets who are struggling in their current coursework a protected time to work on academics. In addition to subject-specific tutoring, students receive guidance in time management, organization, goal setting, and other academic success strategies. NMMI offers an ACT/SAT preparatory program each semester. These courses give the cadet a knowledge base as well as the opportunity to develop skills used in the testing process. This rigorous course provides high school and college students with formal ACT/SAT preparation to help with college placement, scholarship competition, and Service Academy qualification. NMMI participates as a receiving school for the service academy preparatory programs. The non-profit Foundations from the Air Force Academy, US Military Academy, and the Naval Academy sponsor qualified cadets to attend NMMI for one year and participate fully in both the academic program and the Corps of Cadets. NMMI also supports a similar program with the Merchant Marine Academy. Following a successful year at NMMI, these cadets may receive appointments to the academies. NMMI International Center was established for the purpose of enhancing the educational experience of international students on the NMMI campus. One of the IC’s major goals is to assist international students in adaptation and acclimation to this new cultural experience, facilitating the process for them to become comfortable in their new environment. The IC promotes diversity and cultural awareness, resulting in positive interaction between international and American students. It is also responsible for promoting Study Abroad programs and facilitating cultural opportunities on campus. The IC is a resource for both international parents and students, serving as a source of information to navigate the school system and the requirements involved in studying in the US. This 220 seat auditorium is used for classes, lectures, and weekend movies. It is a meeting venue for on and off-campus organizations. Audiovisual resources include wired and wireless microphone systems, video projection from computer, DVD or VHS formats, document camera, and excellent room light control. New Mexico Military Institute has a centralized dedicated guidance, counseling and advising system for high school cadets. The Franklin Student Assistance Center (SAC) is our High School Counseling Center located in Luna Hall. Cadets are assigned an academic counselor/advisor upon enrollment at New Mexico Military Institute. Each high school counselor/advisor is responsible for one high school grade level, moving progressively with that class from sixth class to graduation. Based on the American School Counseling Model (ASCA) a system of developmental advising is implemented for high school cadets whereby the counselor/advisor assists the cadet through a series of advising classes and identifies educational and personal goals. Preparation of the cadet’s graduation plans is provided for guidance to the cadet in the achievement of individual academic goals. Beginning in the Sixth Class year, advisors introduce cadets to time management and study skills, goal-setting and interest inventories, and standardized test taking. The Fifth Class educational expectations are guided by goal setting, the college search, test taking skills, interpersonal relationships, using Naviance and other college and career software, identifying vocational interests/careers/college majors, learning styles, Academy or ROTC search and scholarship information. ACT Aspire testing forms the foundation for setting long and short term goals. The Fourth Class begins the college planning process, identification of potential majors and search for appropriate colleges. Additionally, juniors take the PSAT in the fall and the ASVAB in the spring. The ACT, TOEFL and SAT are highly encouraged during this year. College plans and applications are finalized in the Third Class year culminating in final college choices, applications, scholarship searches and final testing. High school counselors work closely with teachers and the cadets Troop Leadership Advisors (TLA) as they mentor, counsel, advise and advocate for the cadets. Building and establishing a rapport and a caring attitude and providing support for them as they learn to deal with the obligations in academics, in the Corps of Cadets, and the pressures of being away from home. High school counselors act as a resource person providing information on a myriad of topics such as course requirements, learning resources, job markets and selection of colleges after NMMI. They are a liaison between the parents and the teaching faculty, Commandant’s Office and Counseling Center to help assure that the cadet is given every avenue available to succeed. As specialists in personal counseling, academic guidance and counseling the SAC counselors are available to all cadets. They provide cadets with career and educational information as well as administer and interpret achievement tests and interest inventories. New Mexico Military Institute serves as a regional center for Educational Testing Service’s testing programs (PSAT, SAT I, SAT II, GRE, and CLEP) and the American College Testing Programs (ACT Aspire, and the ACT). The Student Assistance Center maintains these regularly updated materials for cadet use: general and specialized college guides and directories, a computerized “Naviance” program on colleges, careers and financial aid; college catalogs and view books, books and pamphlets; videos; general and specialized financial aid guides and directories; college admissions and recruiting materials; admission application materials for schools regularly attended by New Mexico Military Institute graduates; and specialized guidance materials for career preparation. To qualify for the Superintendent’s List a cadet (both high school and college) must earn a minimum GPA of 3.50. The high school cadet must be carrying a load of five* solid subjects (excluding LET) and the college cadet a minimum of 14 non-developmental semester hours. Additionally, the cadet’s deportment grade must be an “A.” Cadets who take grades of Incomplete are not eligible for the Superintendent’s List in the semester in which the Incomplete is received. Credits from developmental courses will not apply. * New high school freshmen and first semester sophomore cadets will be eligible for the Superintendent’s List while taking four solids, if they meet the other requirements. To qualify for the Dean’s List a cadet (both high school and college) must earn a minimum GPA of 3.25. The high school cadet must be carrying a load of five* solid subjects (excluding LET) and the college cadet a minimum of 14 non-developmental semester hours. Additionally, the cadet’s deportment grade must be an “A.” Cadets who take grades of Incomplete are not eligible for the Dean’s List in the semester in which the Incomplete is received. Credits from developmental courses will not apply. To qualify for the Commandant’s List a cadet (both high school and college) must earn an “A” or “B” in deportment and have a GPA of 2.75 or higher during a semester. New Mexico Military Institute maintains a chapter of the junior college honor society Phi Theta Kappa. Election to the society rewards academic excellence and provides additional opportunities for leadership training. Junior college cadets carrying a full academic load, possessing recognized qualities of citizenship, and holding a 3.5 cumulative GPA in non-remedial courses with an A or B in deportment will meet the minimum qualifications for membership. Cadets get an invitation to join, and then log-in to the PTK website to make their application. Induction takes place during the spring semester (formal induction). The National Honor Society Chapter enables the faculty to select and recognize those members of the 10th, 11th and 12th grades who are outstanding scholars and leaders. Each cadet chosen has demonstrated academic ability, leadership, character, and service to his/her peers. Naturally, the honor becomes more difficult to attain as the cadet matures and course work becomes more difficult. Thus, membership at the 12th grade level is a major criterion for acceptance by leading colleges. National Honor Society selection at NMMI requires a 3.4 or higher cumulative GPA. 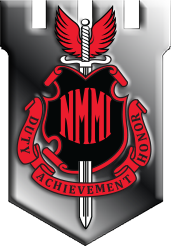 While in attendance at NMMI a grade point average of 2.00 is required of all cadets in order to maintain “good academic standing.” Any NMMI cadet whose GPA falls below 1.50 at the end of a semester may be suspended. Any NMMI cadet whose GPA falls below 2.00 at the end of a semester is placed on Academic Probation. The cadet then has one more semester in which to attain a GPA of 2.00 or better. Failing to do so, may result in academic suspension. Any cadet whose GPA falls below 2.00 will be evaluated by the Academic Review Board. For academic standing awards only, the deportment grade must be as follows: Superintendent/Dean Lists - A (DA); Commandant List - A/B (DA/DB); Good Standing - A/B/C (DA/DB/DC), no award, Academic Probation, Academic Suspension (any deportment grade). Cadets or cadet parents may initiate a withdrawal process (parents will be contacted if cadet is under 18 years of age) for any reason. Upon request to either the Commandant’s Office or Registrar, the information gets passed to the Commandant’s office for coordination with the parents as appropriate, and discussion with the parents and cadet. The Deputy Commander for Operations then coordinates with the Registrar’s office which produces an out-processing checklist for the cadet. The cadet will complete the checklist (if the cadet is still at NMMI) through all offices that the cadet has had contact with (e.g. infirmary, cadet store, library, business office, NMMI post office, financial aid etc.) and will then clear his/her room after an inspection by the Commandant’s office. The checklist will show date of departure and reason and must be completed either by the cadet or the cadet’s TLA in the cadet’s absence. Withdrawn or suspended cadets (academic or deportment) may apply for readmission to the Institute; however, dismissed cadets may not. A cadet who has been placed on suspension may apply to NMMI after a break of at least one semester. The application for readmission must include evidence that the cadet/cadet’s record has improved to the extent that success at NMMI is probable. A cadet who is suspended (deportment) may regain good standing status and only then may transfer work back to meet graduation requirements. The Registrar will report a cadet’s conditional admission and enrollment or probationary status to the cadet, the cadet’s parents, advisor, and the Dean. A cadet who has been Dismissed, Suspended, Withdrawn or “Drop From Rolls” is not permitted to take final examinations nor participate in any further academic assignments. Cadets who have been suspended must regain “good standing” within the academic division (college or high school) from which they departed before they are permitted to participate in challenge examinations and/or be awarded a diploma or degree. Normally a cadet regains “good standing” after the application for enrollment has been approved by the Admissions Committee and the cadet attends academic classes for a semester. However, a cadet, not otherwise eligible to return to NMMI (suspended/depart in lieu of), may regain “good standing” upon the recommendation of the Commandant (deportment) or the Academic Dean (academic) with the approval of the Superintendent/President. Final grades and suspension policy. Cadets must complete the last scheduled day of classes and if suspended/dismissed on or before that day they will receive a WP/WF (college) or W (high school) on their transcript. High school cadets will receive withdrawal grades for the gaining school to use for transfer. If the cadet is suspended after the last day of classes (1530 hours), but before or during finals the cadet will receive a final grade for the class computed with a zero grade for finals not yet completed. Any cadet suspended or dismissed prior to graduation will not graduate with his/her class. Suspended cadets must regain good standing (as specified above) to receive their diploma. Cadets who complete all course requirements, including final exams, will receive letter grades on their transcripts for all courses completed. However, if a cadet completes all work toward a high school diploma or associate degree but is dismissed or suspended just prior to graduation, but after the last day of classes, that cadet will not receive his/her diploma or degree, nor take part in graduation. The transcript for high school cadets will be annotated “Met NMMI requirements for graduation. Diploma not awarded. Cadet withdrew.” However, a cadet, may regain “good standing” upon the recommendation of the Commandant (deportment) or the Academic Dean (academic) with the approval of the Superintendent/President. Graduating cadets who have completed at least nine weeks of work with a grade of “C” or better may be eligible for graduation, if their work, all other academic work, Corps requirements and financial requirements are complete at the time of withdrawal. Name changes are only accepted with proper legal/court documents. NMMI will correct the record as requested, but will maintain former names for record keeping inside the cadet database. Transcript requests must be in writing. For cadets over 18 or enrolled in college work, the request must come from the individual whose name is on the transcript. Parents may request transcripts on high school cadets who are not enrolled in college. Transcript request forms are in the Registrar’s office or can be found on the Registrar’s website - http://registrar.nmmi.edu. NMMI now uses an electronic ordering service for transcripts. Transcripts can be ordered at https://www.nmmi.edu/reg/transcripts/.